Full Description: Hello Koalas Sculpture Trail, designed by project manager Arts and Health Australia, comprises 56 one metre high Hello Koalas fibreglass sculptures, featuring original designs by Australian artists - many of them local. The Trail is supported by many business, government and community organisations, including the acclaimed Port Macquarie Koala Hospital, which is the principal project partner. 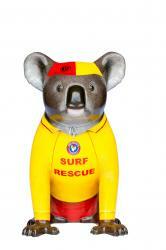 Promoting koala care and conservation is a key objective of the Hello Koalas Sculpture Trail. The Hello Koalas sculptures dot the Port Macquarie-Hastings landscape from the mountains to the sea and showcase the natural beauty of the region and promote the wide variety of attractions and events available to visitors and the local community. The award winning Hello Koalas Sculpture Trail is a bold, ambitious and imaginative sculpture project, which celebrates one of Australia’s iconic animals – the Koala. Above all, it is designed to generate a sense of fun and surprise for everyone who comes across one of the creatively decorated koalas resting in parkland, lazing by the river, waiting outside the shops, or playing with children. Awards include: 2016 Certificate of Excellence, TripAdvisor - Rated No 3 our of 67 Things to Do in Port Macquarie 2016 Winner, Greater Port Macquarie Business Awards 2016 & 2015 Award Winner, NSW Tourism Awards and North Coast Tourism Awards The inaugural Hello Koalas Festival will launch in June 2017.